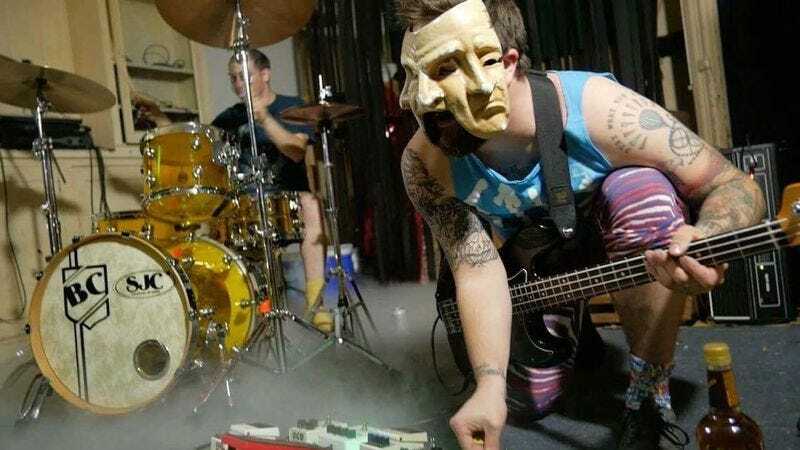 Chicago two-piece Space Blood is an instrumental math-rock band that cites both Battles and The Eric Andre Show as influences. And while that may sound like little more than clever marketing, there’s an absurdist streak that informs Space Blood’s approach, even when it’s wordless. This spring, the band will release Tactical Chunder, which was recorded by Sanford Parker at Steve Albini’s Electrical Audio Studios, on Lonely Voyage Records, but The A.V. Club is premiering the first track from the album today. “NSFW (Nick Sintos For Work)” is built on a chugging bass riff and drums that lock in, pushing the song with spastic pulses, always feeling a hair off while somehow making it feel totally right. Tactical Chunder is available for pre-order now.